Puppets Are Not For Children Anymore!" Perfect for all ages and academic levels, the power of puppetry captures the attention of students and educators by exploring the many aspects of this fascinating ancient art form. Please consider one of our unique puppet shows, puppetry workshops, or a guest artist-in-residence programs. Puppet Pizzazz has many standard shows and classes to choose from, but can also create a performance, workshop, residency, or other puppet related activities such as parades and plays, specifically designed to fit the participant’s needs. Our puppetry educational experiences have had great success in schools, universities, libraries, camps, festivals, hospitals, churches, senior centers, shopping malls, and community events. 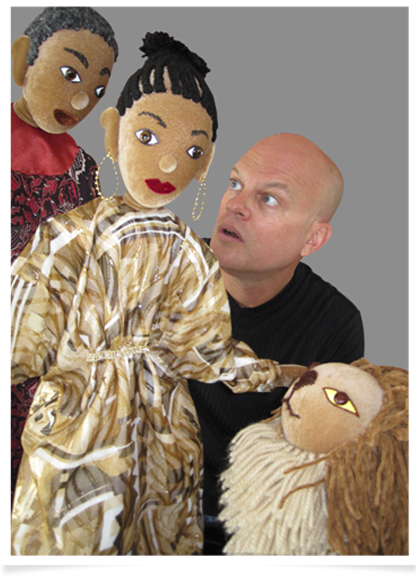 Puppet Pizzazz has provided quality educational puppet performances and workshops for the past 20 years. We would like the opportunity to share our services with your schools or any place searching for puppetry enlightenment.